Cisco, VMware and Microsoft disappointingly chose the easiest way out: VXLAN and NVGRE are MAC-over-IP virtual networks with no control plane. They claim they need layer-2 virtual networks to support existing applications (like Microsoft’s load balancing marvels) and rely on flooding (emulated with IP multicast) to build the remote-MAC-to-remote-IP mappings in hypervisor virtual switches. Nicira’s Network Virtualization Platform is way better – it has a central control plane that uses OpenFlow to distribute MAC-to-IP mapping information to individual hypervisors. The version of their software I’m familiar with implemented simple layer-2 virtual networks; they were promising layer-3 support, but so far haven’t updated me on their progress. We know application teams trying to deploy their application stacks on top of virtual networks usually need more than a single virtual network (or security zone). A typical scale-out application has multiple tiers that have to be connected with load balancers or firewalls. All the vendors mentioned above are dancing around that requirement claiming you can always implement whatever L3-7 functionality you need with software appliances running as virtual machines on top of virtual networks. A typical example of this approach is vShield Edge, a VM with baseline load balancing, NAT and DHCP functionality. To keep the record straight: VMware, Cisco, Juniper and a few others offer hypervisor-level firewalls; traffic going between security zones doesn’t have to go through an external appliance (although it still goes through a VM if you’re using VMware’s vShield Zones/App). Open vSwitch used by Nicira’s NVP could be easily configured to provide ACL-like functionality, but I don’t know how far Nicira got in implementing it. Their virtual networks solution has layer-2 virtual networks that you can link together with layer-3 virtual routers. Each virtual port (including VM virtual interface) has ingress and egress firewall rules and chains (inspired by Linux iptables). Virtual routers support baseline load balancing and NAT functionality. Virtual routers are not implemented as virtual machines – they are an abstract concept used by hypervisor switches to calculate the underlay IP next hop. As one would expect in a L3 solution, hypervisors are answering ARP and DHCP requests locally. The edge nodes run EBGP with the outside world, appearing as a single router to external BGP speakers. Interestingly, they decided to go against the current centralized control plane religion, and implemented most of the intelligence in the hypervisors. They use Open vSwitch (OVS) kernel module as the switching platform (proving my claim that OVS provides all you need to implement L2-4 functionality), but replaced the OpenFlow agents and centralized controller with their own distributed software. Their forwarding agents (running in user space on all hypervisor hosts) intercept traffic belonging to unknown flows (much like the ovs-vswitchd), but process the unknown packets locally instead of sending them to central OpenFlow controller. The forwarding agent receiving an unknown packet would check the security rules, consult the virtual network configuration, calculate the required flow transformation(s) and egress next hop, install the flow in the local OVS kernel module, insert flow data in a central database for stateful firewall filtering of return traffic, and send the packet toward egress node encapsulated in a GRE envelope with the GRE key indicating the egress port on the egress node. According to Midokura, the forwarding agents generate the most-generic flow specification they can – load balancing obviously requires microflows, simple L2 or L3 forwarding doesn’t. While the OVS kernel module supports only microflow-based forwarding, the forwarding agent doesn’t have to recalculate the virtual network topology for each new flow. The egress OVS switch has pre-installed flows that map GRE keys to output ports. The packet is thus forwarded straight to the destination port without going through the forwarding agent on the egress node. Like in MPLS/VPN or QFabric, the ingress node performs all forwarding decisions, the “only” difference being that MidoNet runs as a cluster of distributed software switches on commodity hardware. Asymmetrical return traffic is no longer an issue because MidoNet uses central flow database for stateful firewall functionality – all edge nodes act as a single virtual firewall. The end result: MidoNet (Midokura’s overlay virtual networking solution) performs simple L2-4 operations within the hypervisor, and forwards packets of established flows within the kernel OVS. Midokura claims they achieved linerate (10GE) performance on commodity x86 hardware ... but of course you shouldn’t blindly trust me or them. Get in touch with Ben and test-drive their solution. Update 2012-10-07: For more details and a longer (and more comprehensive) analysis, read Brad Hedlund's blog post. There is mention of a "central database", but it's also stated this is a distributed system with no centralized control plane. How do the forwarding agents in each OVS synchronize and achieve consistent state? Hi Brad, that's a very good question. Without going into the precise details of the synchronization mechanisms, here's the basic idea: Virtual network configuration, such as the virtual topology, is eventually consistent with respect to changes made via the REST API, while per flow state is statistically highly consistent, though not linearizable. We use a combination of ZooKeeper and Cassandra to implement the "central database". 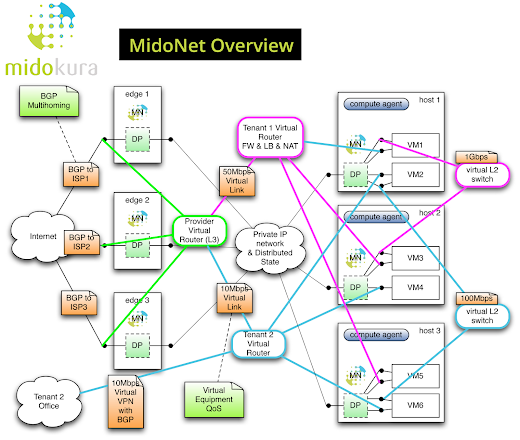 MidoNet agents make independent decisions, such as handling control packets like ARP, ICMP, DHCP and setting up new flows, based on their local view of the virtual network state. If the virtual network configuration (virtual topology as well as virtual device config) changes and two edges see that change with a lag delta, then some flows will be forwarded according to the old configuration while others are forwarded according to the new configuration (during the period of convergence). The flows are all correct with respect to at least one valid configuration (since decisions are all taken at the ingress edge node). Which flows are still being forwarded according to the old configuration is arbitrary, but that's fine. Existing flows are also invalidated and recomputed when configuration changes. So Cassandra and ZooKeeper work as a replacement for OpenFlow. No network protocols. No central controller. Distributed state synchronised via a distributed DB and distributed systems tools. Why not go with OpenFlow? How are convergence times calculated? What happens with wrong flows that are setup before state is consistent? Are they a drop & retry? Is the flow forwarded to the correct destination by the previous destination as if nothing had happened? Pablo Carlier. - (Disclaimer: I am a Cisco Systems Engineer). Do they mention if their firewall or load-balancing logic is modular in a way that third party vendors could develop their own MidoNet FW or LB module? If that's the case then install a few OC12 PCI express cards in your UCS chassis or blade enclosure and toss those ASRs out. I hear Cisco has similar functionality with their CRS. This is very cool... could run BGP from their stuff into a PER... keep security zones separate as VRFs... This is kind of awesome right here. Hi Derick, thanks for the positive comment! We created this virtual device model in order to provide a familiar interface that blends be best of VRFs, Amazon VPC, and L2 switching. 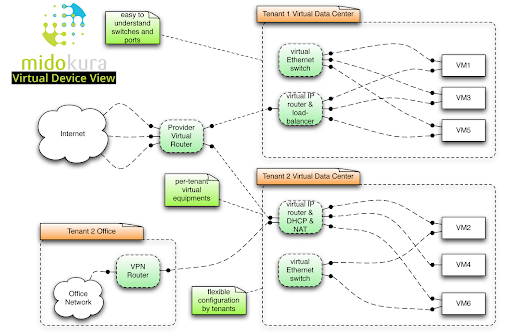 The VRF model seems to map well to the multi-tenant IaaS cloud (OpenStack) use case. Our OpenStack plugin creates a virtual router per "project" (virtual data center, VPC, whatever term you like), and attaches multiple L2 networks to it. The service provider's virtual router is wired to each of the projects for routing global IPs. How is vMotion handled ? When a VM is migrated by the cloud management system, e.g. OpenStack, the virtual port to which the VM is logically attached is bound to a tap/veth on the target host, at the end of the migration process. At that time, the new mapping of vport to host is propagated to all MidoNet edges who have flows going to that vport, at which point those flows are updated to tunnel to the new target host. So unlike some other forms of vMotion, there is no need to use gratuitous ARP to update switch state, or any such nonsense. If the virtual router is a abstract concept how is BGP peering on the Provider Virtual Router implemented? Is OSPF used between Tenant Virtual Router and Provider Virtual Router? The virtual routers are not really instances of routers, but rather just configuration state which the MidoNet agents at the edges use to simulate the flows as they would traverse the virtual network topology. So while the virtual router is abstract, the uplink ports of the virtual router are bound to actual ethernet interfaces on edge gateway nodes. The edge gateway nodes run BGP sessions with the upstream peers, and update the routing table in the distributed database, which is then shared with other MidoNet agents, as needed. Are the edge gateway nodes linux servers or vendor routers ?If they are vendor routers does that mean we have to configure gre tunnels for this to work ? Is MidoNet forwarding agent using Intel's DPDK? Why does this company or at least their solution not get more publicity ? There should be a lot more companies doing this. No really, I've been searching for a similar to their solution for months now. I know it kind of looks like it they are going against the whole networking industry, but this really is the natural evolution. Because they started in the wrong geography? It's amazing how many great solutions are hidden "out there" as compared to some of the mediocre stuff that gets funded in the Valley. As for packetpushers, you'd have to ask the podcast hosts. Finally, send me an email if you'd like to get in touch with Midokura but can't find their contact details. Now that I know who they are I can get in contact with them. I meant I've not seen any other company or open source project which has a virtual router on the hypervisor. And I only found this article yesterday. I can setup routing software on Linux, if Linux is running the hypervisor, but then you have to figure it all out on yourself. Contrail also has L3 functionality in the hypervisor, as does Hyper-V Networking Virtualization. Maybe I was looking in the wrong place, but I never found good documentation about Hyper-V Network Virtualization that did L3. Maybe I should explain what I want: I want the host running the hypervisor to use dynamic routing to route it's overlay traffic around L2 or L3 failures. Servers are equipped with multiple network connections why don't we use them to their maximum potential.